PRINCETON, NJ -- Gallup's U.S. Job Creation Index reached a new high in its more than six-year trend, registering +27 in May. The prior high had been +26 in the initial monthly measurement of January 2008, just as the recession was taking hold. The index is based on employee reports of hiring activity at their places of employment. The +27 index score for May is based on 40% of employees saying their employer is hiring workers and expanding the size of its workforce and 13% saying their employer is letting workers go and reducing the size of its workforce. Another 41% report no change in staffing. After starting out at a fairly high level in January 2008, the index quickly sank over the course of that year as the recession deepened. 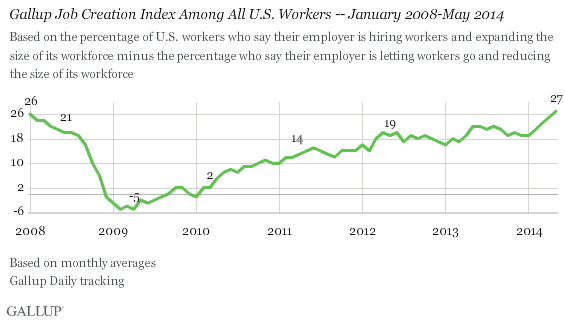 The index was in negative territory for much of 2009, meaning workers on average said their employers were cutting more workers than they were adding. This included record-low job creation scores of -5 in February and April 2009. By 2010, the index began to improve, reaching +10 by October 2010 and +20 in April 2012, hovering about the +20 mark throughout 2012 and 2013. After starting this year at +19, the index has shown gains of exactly two points each month. Job Creation Index scores were largely similar by region in May, averaging +27 in the Midwest and West and +28 in the South. Only the East showed lower job creation, at +23. Workers in the East have typically been a bit less positive about the hiring situation than workers in other parts of the country since January 2013. Hiring activity continues to be much stronger in the private sector than in the government sector, with an index score of +29 among nongovernment employees (41% hiring and 12% letting workers go) and +14 among government employees (35% hiring and 21% letting workers go). Both indexes are improving, however, with the private sector score at a new high and the government sector score two points below the January 2008 high. Nongovernment hiring has a bigger effect on the overall index score because many more workers are employed in the private sector than the government sector. 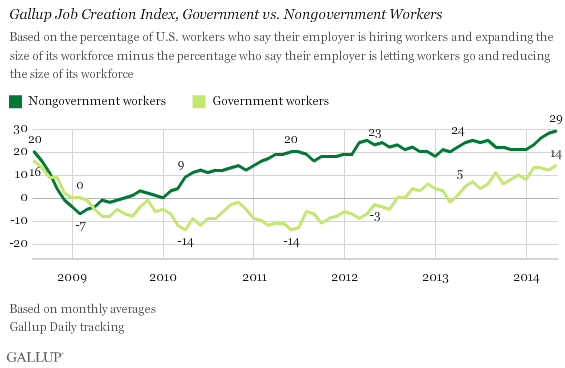 According to Gallup's estimates, there are more than five private-sector workers for every one government worker. Net hiring reports differ across the various levels of the government sector. State and local government workers continue to report a more positive hiring situation where they work than federal government workers do. In fact, federal workers are about as likely to report their employer is letting workers go (33%) as to say they are hiring workers (34%), for an index score of +1. The index score among state workers is +19 and among local government workers it is +18. These state and local versus federal differences have been consistent since 2012. Even though the net hiring score among federal government workers is lower on a relative basis, it is much improved from -19 in December 2011. Job creation is undoubtedly one of the key aspects of a strong economy, and U.S. workers now report a more positive hiring situation where they work than at any point in the last six years. The trend is consistent with the government's latest four-week average of initial jobless claims, which is the lowest in more than six years. The private sector is driving much of the improvement in hiring. Government-sector hiring has picked up, too, although this has been mostly at the state and local levels. The more positive hiring picture, along with Americans' higher reports of spending, are important signs of a healthier U.S. economy, though Americans still rate economic conditions more negatively than positively. Americans' still-negative economic outlook is understandable because not all economic indicators are positive. These include a decline in the gross domestic product in the first quarter of 2014 and unemployment rates that, despite improvement, are still higher than pre-recession levels. Results for this Gallup poll are based on telephone interviews conducted May 1-31, 2014, on the Gallup Daily tracking survey, with a random sample of 17,993 adults, aged 18 and older, living in all 50 U.S. states and the District of Columbia, who are employed full or part time. For results based on the total sample of workers, the margin of sampling error is ±1 percentage points at the 95% confidence level. Gallup's U.S. Economic Confidence Index registered -14 in May, the highest monthly reading in 2014 so far. Americans are most likely to name jobs (20%), government (19%), and the economy (17%) as the most important problems facing the country. Democrats are most likely to cite jobs, while Republicans are most likely to mention the economy.